Today’s post is from Museum Explainer Juliet Downie. As an Explainer at The Corning Museum of Glass, I receive training on the history of glass, from the ancient world to the modern era. The uses of glass have changed and expanded dramatically over the centuries, but one application of glass has remained nearly constant for nearly 3500 years: the perfume bottle. Glassmaking began in Mesopotamia (modern-day Iraq and Syria) and soon spread to Egypt. 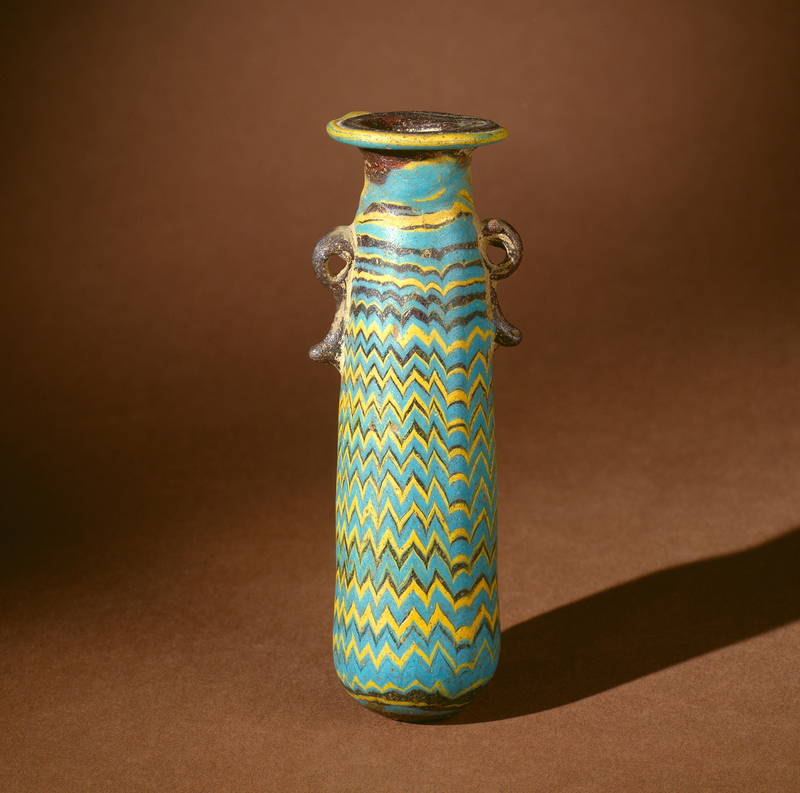 Some of the earliest glass vessels were made to hold perfumes and other cosmetics. These vessels, including the example shown below, were core-formed. They were most likely created by dipping a core of clay and animal dung into a small pot of molten glass, so that the molten glass fully encased the core. While the layer of molten glass was still hot, trails of glass of contrasting colors were wound onto the vessel as decoration. After the glass hardened and cooled on the core, the porous core material could then be scraped out, creating a hollow vessel. Perfume bottle, core-formed, trailed. Eastern Mediterranean, 599-400 BC. H: 9.5 cm; Rim Diam: 3 cm. 50.1.5. Because the process for making core-formed perfume bottles was laborious and time-consuming, these vessels were costly and available to only the wealthiest citizens of ancient civilizations. 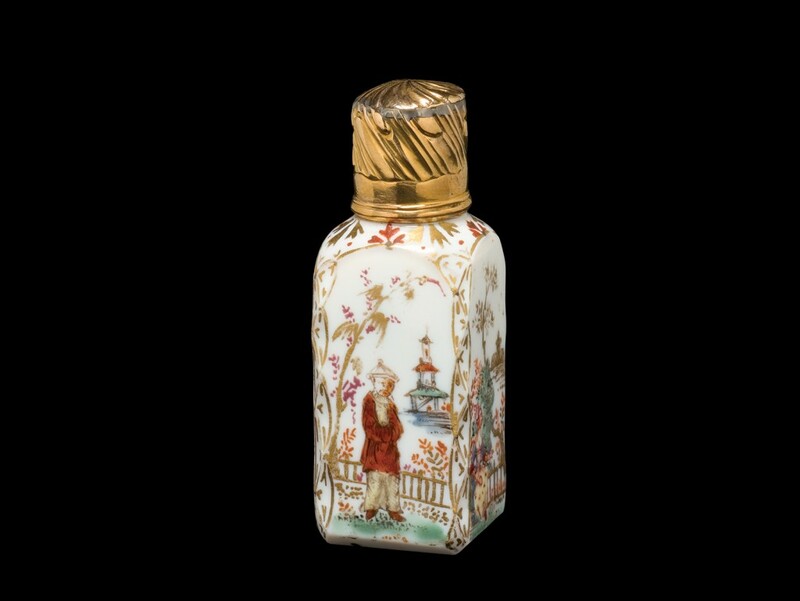 Elite members of society—mainly political leaders and religious nobility—used the small vessels to hold a variety of scented oils and cosmetics. Glass blowing was discovered in the eastern Roman Empire during the first century B.C. This innovation greatly broadened the production and availability of glass vessels. 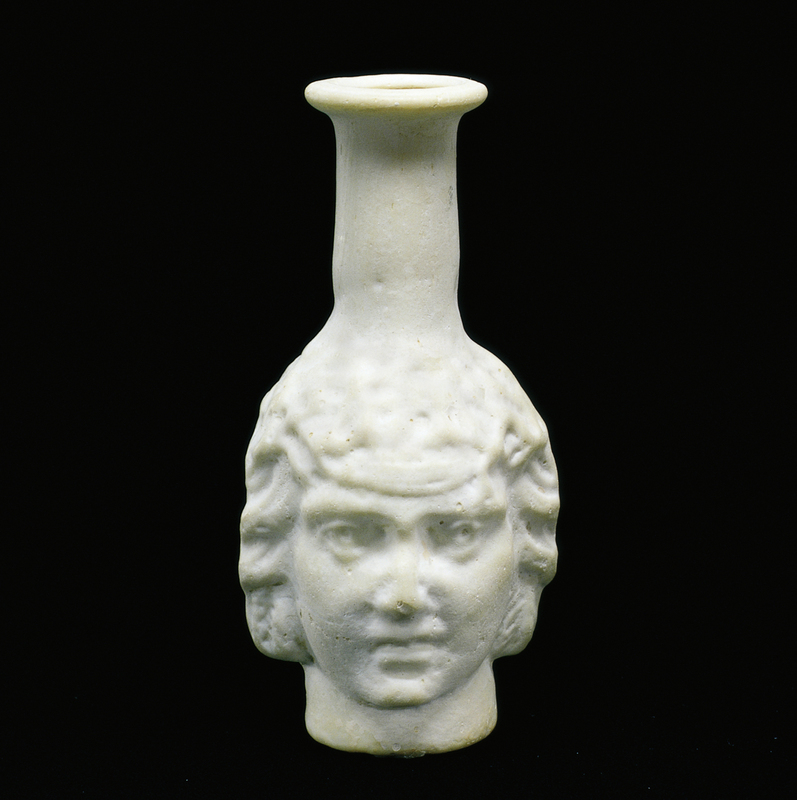 Although glass began to be made in greater quantities and its use expanded to include larger storage vessels, Roman glassmakers also continued to make small cosmetic bottles out of glass. They used newly developed techniques such as mold blowing, as shown in the example below. Bottle with Two Faces, mold-blown. Eastern Mediterranean, 100-199. H: 7.7 cm, W: 3.6 cm; Rim Diam: 2 cm. 66.1.256. Roman blown glass perfume bottles were widely produced and accessible to many across the Roman Empire and beyond its borders. Yet Roman glassmakers also created luxury glass bottles made using techniques such as cameo glass; these vessels remained commodities afforded only by the wealthy. After the western Roman Empire collapsed around 476 A.D., Europe entered the a period commonly known as the Middle Ages. 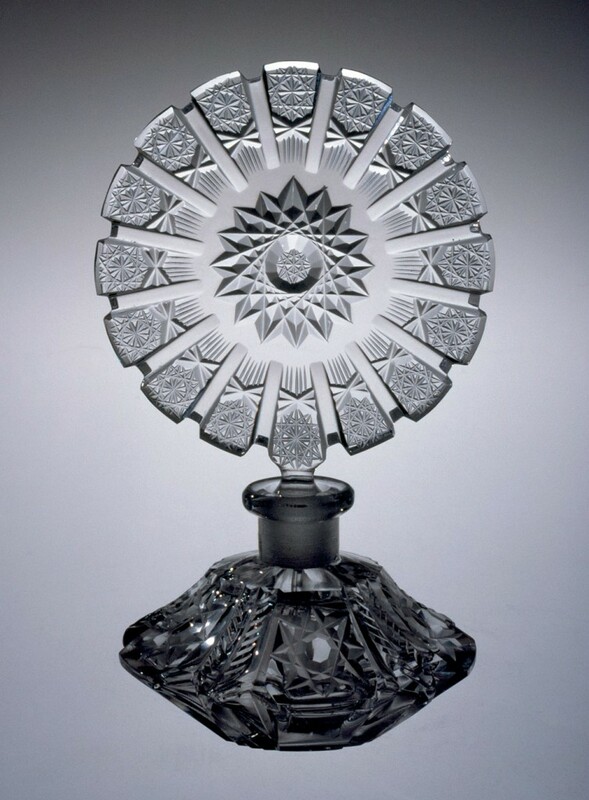 This period was characterized by a sharp decline in the production of many types of luxury glass, including perfume bottles. The glass perfume bottle industry did not rebound for nearly 1,000 years, when the Renaissance sparked a rebirth of innovation and creativity in Italy. By the early 15th century, Venice had become renowned as a center for glassmaking, and Venetian glass products, including perfume bottles, were respected—and eventually, copied—by other glassmaking regions in Europe and the Middle East. Thin, fine cristallo bottles won Venice prestige, and were soon imitated by glassmakers in England, Austria, France, Spain, and the Low Countries. These vessels became labeled as façon de Venise. Yet by the mid-18th century, England, in particular, became known for producing unique glass perfume bottles decorated with gilding and enameling. Some vessels were designed to resemble not Venetian glassware, but Chinese porcelain; many were decorated in the popular chinoiserie style, as shown in the example below. Scent Bottle with Stopper and Cap, England, probably London, 1760. 86.2.24, gift of Helen Mayer in memory of her husband, John. The Industrial Revolution of the 1800s led to further changes in the glass perfume bottle industry. Glass bottles could now be quickly and easily mass-produced using the mechanical glass press. During this era, the French perfume industry also grew to achieve international renown. By the early 1900s, perfume companies across the world began to use elegant vessels, labels, and packaging to advertise their wares and appeal to customers. The French glassmaker René Lalique helped to guide the perfume industry into the modern world of the early twentieth century. 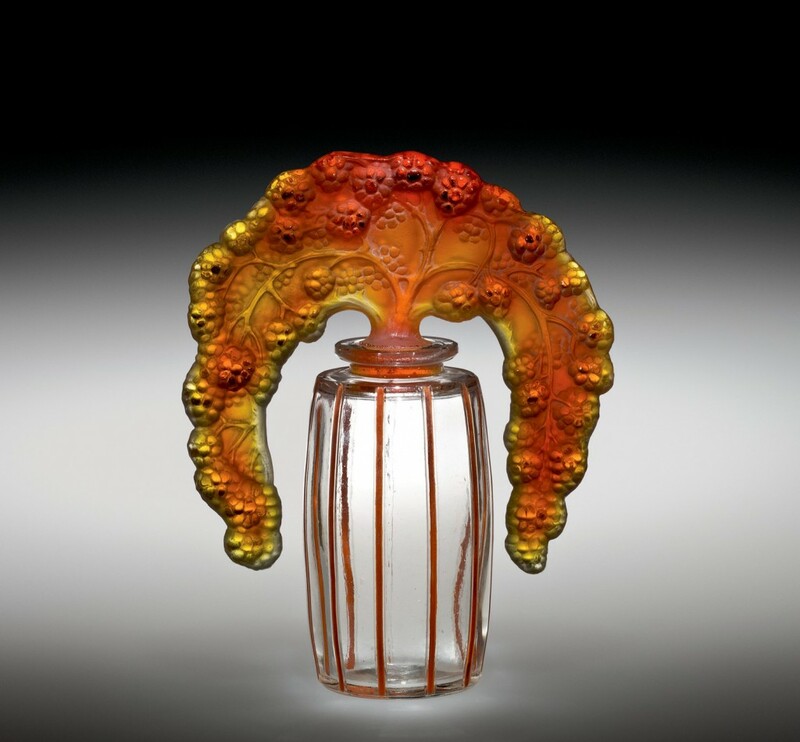 Lalique designed perfume bottles for François Coty and other famous perfume makers. Many of these bottles are currently on display in the Museum’s special exhibition, René Lalique: Enchanted by Glass. Bouchon mûres (Berry stopper), mold-blown, mold-pressed, applied patina, acid-etched. René Lalique, France, Combs-la-Ville, Lalique et Cie., designed 1920. H: 11.7 cm, W: 9.2 cm, Diam: 4.1 cm. 2011.3.250, gift of Elaine and Stanford Steppa. Some cosmetics companies, including Avon and Max Factor, began to market their products to a more working-class clientele using inexpensive pressed glass bottles in a variety of shapes. Other companies, such as Baccarat and Steuben, continued to produce high-end cut glass perfume bottles. By the mid-20th century, the perfume market had expanded dramatically and perfume had become available in a variety of scents and at a range of price points. Glass perfume bottles reflected the wide array of perfume options that were offered to the modern consumer. Throughout its long history, perfume has served as a marker for social status; the glass bottle in which the perfume was sold and stored helped to establish its prestige and that of its wearer. As the composition of perfume has evolved over the centuries from blends of scented oils to mixtures of complex and synthetically derived compounds, so too has the glass perfume bottle adapted to fit the changing times. Perfume Bottle with Stopper, cut glass. Czechoslovakia, 1950-1960. H: 16.4 cm. 74.3.175, gift of Mrs. Anna Fern Sherwood.